07:45 - 08:30: Tour guide picks you up at hotel then take 3.5 hour scenic drive to Ha Long city. Have a break 20 minutes en-route to free your legs. 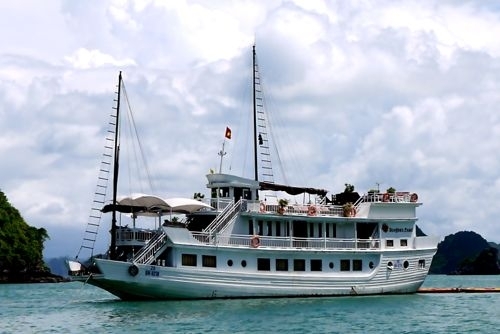 12:15: Embark Bai Chay harbor, get transferred to Dragon Cruise by a tender and enjoy a welcome drink. 13:00: Receive a cruise briefing. Savor delicious lunch while cruising among wonderful limestone island. 14:30: Stop at Ti Top Island one hour for swimming, sun-bathing or getting a panoramic view on island peak. 15:30: Do kayaking among hidden parts and around Bo Nau cave to discover mysterious beauty of Ha Long. 16:30: Experiencing unforgettable memory passing through “tunnel cave” on a bamboo boat to a secluded lake. 18:00: Take part in a “cooking class” on board making some special dishes with our chef then enjoy it. 17:30: Drop anchor in calm water area and enjoy some local wine, fruits on the sundeck at sunset. 19:00: Have a delectable dinner in cozy restaurant of Dragon Cruise in the middle of Ha Long. 20:00: Entertain evening by karaoke singing or try your luck doing squid-fishing. 07:00: Start your new day with complimentary tea and coffee served, photograph magnificent pictures. 07:30: Have breakfast on board, get your cameras ready then go off boat. 08:00: Visit Sung Sot “amazing” cave, the most beautiful with millions of surprising stalactites and stalagmites. 09:30: Check out your cabin. Relax on sundeck for sun-bathing, photo hunting while sailing back to the harbor. 11:30: Leave Dragon Cruise, have a short rest and take a bus drive to a local restaurant for lunch. 13:30: Say goodbye to Ha Long bay then return to Hanoi. Have a rest en-route again to free your legs. 17:30 Get dropped off at your hotel. Meals: 2 lunches, 1 dinner and 1 breakfast. Tips, VAT and others not clearly mentioned above.